Chinese telecoms giant Huawei has confirmed it is in talks with Microsoft about its use of Android software. Microsoft claims that Google's Android operating system infringes its intellectual property rights. It has already convinced Samsung, HTC and others to pay it patent royalty fees. Huawei Device's chief marketing officer, Victor Xu, said the discussions are "in progress". He also revealed that the firm plans to open a new design centre in London. Huawei has picked the UK as the launch point for its international roll-out of smartphones and tablet computers. The Shenzhen-based firm says it plans to expand into the US, Japan and India next year, and then other parts of the world in 2013. "Over the next three years we are aiming to be in the top five smartphone makers, and in the top three in the next five years," said Mr Xu. "We have established very aggressive targets in the market." To help distinguish itself Huawei is opening three design centres outside of its homeland. The first, in London, will concentrate on the European smartphone market. It is being run by Mark Mitchinson, a mobile industry veteran who previously worked for Nokia, Samsung and Carphone Warehouse. "We are bringing products - more vanilla at the moment - to market, and they are going to be very affordable," he told the BBC. "Going forward we will be developing products that are much more advanced in their look and feel," he explained. "But that will come as we develop what we are doing in terms of our London design centre." 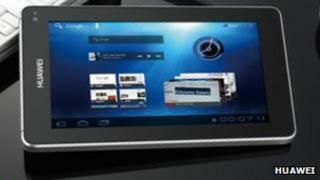 Huawei's initial line-up includes its Blaze and Vision smartphones and a 7-inch tablet, the MediaPad. Although the devices do not have the most advanced specifications, they are competitively priced to help deliver Huawei's target 18-34 year old market. "Our profit margins aren't probably where we would like them to be maybe in a few years down the line," Mr Mitchinson said. "[But] we will be making a profit on these devices. They are not loss leaders. I think the profit will probably increase as we go through in terms of how we evolve as a brand." Huawei's mobile device roll-out could lead it into a clash with Microsoft. The US company claims that the Android system, which is used by Huawei's devices, exploits some of its innovations. However, Huawei's marketing chief hinted that his firm is able to defend itself. "We always respect the intellectual property of key companies," Mr Xu said. "At the moment we have more than 65,000 patents and we have enough instruments to protect our interests." Microsoft said it would not comment on the status of "confidential patent licensing discussions". Huawei built up its patent portfolio as it grew into the world's second-biggest network and telecoms equipment supplier. Its products are used in 140 countries, and many analysts believe it is only a matter of time before it overtakes Sweden's Ericsson. Huawei says that its background leaves it well placed to offer cloud-based add-on services for its devices. However, Huawei's Chinese identity has caused suspicion in some quarters. The US Department of Commerce barred the company from building a wireless network for its emergency services because of "national security concerns". Earlier this week the the firm also made headlines when it confirmed it had sold telecoms equipment and a "news delivery platform" to Iran. But Huawei says it is not worried about an image problem as it tries to become a consumer brand. "I don't think this is a threat or a challenge," Mr Xu told the BBC. "We are using an open-source-code operating system and an open-source chipset. Everything is open." Huawei has repeatedly denied links to the Chinese army and stressed that it is a private business. "Why people can believe it's a threat to national security - it's nonsense," said Mr Xu.